We know cities are cool again, and as a result supermarkets now think so too. We also know auto-oriented suburban supermarkets with vast parking lots in urban area won’t fly. So how are the next generation of urban supermarkets fitting in? By getting smaller. Under 5000 s.f. corner stores, micro grocery stores: These not-so-big neighborhood grocery stores under 2000 s.f. have always fit in just fine, just don’t call them Mom & Pops anymore (an image search will show you why not). Why? Because they’re human-scaled, walkable, potentially ubiquitous and require no parking. In other words, timeless. Examples: The 2000 s.f. Local D’Lish in Minneapolis, MN and 550 s.f. Mayberry Foodstuffs in Cincinnati, OH. Also, check out the Healthy Corner Stores Network supporting underserved communities with healthy food options. 5000 – 15,000 s.f. cafe supermarkets, neighborhood supermarkets, co-ops, food halls: This is that sweet spot in size where the average urban dweller can do most of their shopping, and where it becomes so difficult to compete with economies of scale that these stores are typically regional chains, unless it’s a co-op, an extraordinary community asset when it exists. One local approach is focus on not more than a handful of locations (some say anything over five stores that aren’t all in the same city constitutes a chain), or host a local cafe. The New Seasons Market in Portland, Oregon provides 90 bicycle parking spaces, almost three times the number of car parking spaces. On the chain side of thing, Trader Joe’s and Fresh & Easy Market at least create their own brands, emphasizing affordability, healthy eating and a friendly atmosphere. 20,000 – 40,000 s.f. destination supermarkets This is the maximum size a neighborhood supermarket should be in natural cultural districts, and even mega-chains like Wal-Mart understand this, though yes, it’s still Wal-Mart. At this size, there’s an opportunity to not only provide a full-sized cafe and specialty food stations (like at Urban Fare in Vancouver, Canada, pictured above), but even reorganize the entire store as a food hall a fast-growing trend. 50,000 and up In those increasingly rarer instances when national chains won’t size down their 50,000 to 60,000 supermarkets, they can be located in corporate retail districts, which should be distinct and separate from natural cultural districts. On the positive end for pedestrians, auto parking is completely hidden underground, to the side or above. 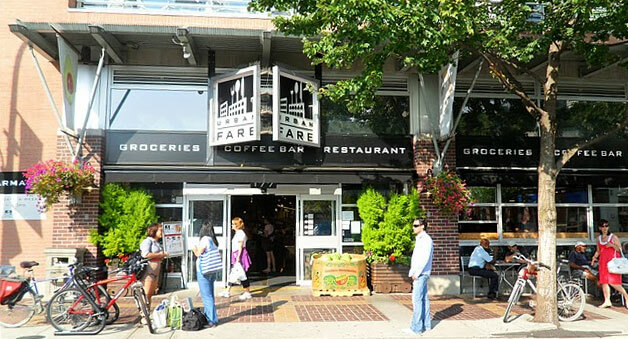 Read more in the Urban Land article, “The Rush to Build Walkable Urban Grocery Stores“. One of my fondest memories is shopping for groceries in Provence, France. There was NO supermarket. As I walked home from the commuter train after a day of researching through dusty books with my then doctoral candidate daughter, we would stop at shops to pick up the fixings for dinner. We purchased a rÃ´tissez le poulet (roast chicken) from one small spot; stopped at the boulangerie for a baguette; and topped it all off with a bottle of wine. An added treat was the fresh produce brought into the city that morning from the countryside. I didn”t know asparagus could taste that good but I digress. As I was reading this blog about downsizing the grocery stores I couldn”t help but reminisce. I would dearly love to live in a neighborhood in which this set up of small shops selling all things fresh and healthy was a walk from my house to the commuter train or better yet to my walkable place of employment. A vision of this type of neighborhood spurred my husband and I to start Bronzeville Urban Green (B.U.G). We realize that not only urban settings are conducive to this model. However, recently we started working with another Chicago group attempting to address food deserts in Chicago”s least economically stable communities. They will be launching Fresh Moves, a mobile market bringing fresh produce to the inner city. Who knows maybe by combining their ideas and our arduous task of turning an abandoned rail embankment to 1.5 miles of greenhouses will bring the flavor of Provence along with good food to the urban food deserts. Stay tuned. Interesting but that photo and Urban Fare is near where I live. This is a “hybid” type of market. It has a deli and area where people can chill on couches. It’s essentially like a Starbucks built into a grocery store. The bonus is that you can order hot food also. So this is far more than just a simply grocery store concept. If you walk about 4 blocks from this one, you will find a Nesters which copies the urban concept. Get people from the neighborhood to stay a bit longer. Dare I say it can be trendy hanging out at a grocery store? Well that’s the market (no pun intended) these grocery stores are aiming for.